At the end of a hectic schedule addressing election rallies in the South, President Mahinda Rajapaksa returned to ‘Temple Trees’ last Monday evening. There he sat down to a discussion with Deputy Minister Muthu Sivalingam and Central Provincial Councillor Senthil Thondaman. The Ceylon Workers Congress duo was meeting Rajapaksa to urge that an interview be granted to Tamil Nadu’s Thanthi television network ahead of the presidential election. He agreed and the recording took place at ‘Temple Trees’ on Wednesday. When the discussion was under way, T. Sri Ranga, a parliamentarian elected on the UNP ticket and now supporting the UPFA Government walked in to offer some unsolicited advice. He pointed to places where cameras and lights should be placed and how Rajapaksa should face them. He later withdrew. Rajapaksa was visibly tired after addressing a string of election rallies. He told aides that he needed to rest and withdrew to the Janadipathi Mandiraya (Presidential Palace) in Fort. It was past 1 a.m. when a phone call woke him up. At the other end was Sri Ranga. He complained that he was assaulted by Minister Rishad Bathiuddin whilst he was at ‘Temple Trees’. An angry Rajapaksa queried whether that was the time to talk about the matter and declared he would go into it in the morning. It transpired that Sri Ranga had arrived at ‘Temple Trees’ in the company of H.M.M. Harees, a Sri Lanka Muslim Congress (SLMC) parliamentarian from the Ampara District. They had been at the dining table chatting with others present. The duo had just finished dinner from a daily buffet at the southern end of a spacious hall. It was a few minutes to midnight when Minister Bathiuddin, leader of the All Ceylon People’s Congress (ACPC) clad in a light green T-shirt, came near the dining area. He was accompanied by Y.L.S. Hameed, party secretary and Ameer Ali who is the latest MP to be sworn in on the National List. The trio were armed with a Memorandum of Understanding they hoped to sign with the UPFA Government. ACPC leader Bathiuddin announced earlier that the party would support the UPFA Government. Bathiuddin is known to be the main figure behind the launch this week of a Tamil newspaper (merging the existing Navamani), a radio and a television station for Muslims. Economic Development Minister Basil Rajapaksa was the chief guest at the launching ceremony where the guest of honour was Karu Jayasuriya, senior UNP parliamentarian. Substantial funding for the project has come from the World Muslim Congress in Saudi Arabia. There is little doubt that the licenses issued for the new media outfits were a factor that influenced the ACPC to remain in the UPFA and support it. An eye witness said Bathiuddin was incensed when he saw Sri Ranga seated near the dining table. He turned to Gamini Senarath, Chief of Staff at the Presidential Secretariat, who was then having his dinner and told him not to entertain people who were “lowly”. He used some strong language. A verbal duel ensued. Sri Ranga charged that Minister Bathiuddin has had a recent meeting with Mangala Samaraweera at the Kotte residence of UNP Assistant Leader Ravi Karunanayake. He claimed he had conveyed this to President Rajapaksa too. However, Karunanayake told the Sunday Times “there is absolutely no truth in that claim. On no occasion has Bathiuddin come to my residence.” An enraged Bathiuddin alleged that Sri Ranga was “spoiling” the name of the President, his son Namal and added “mey aanduwa nanattara venney moo nisai (It is because of him that the Government would be left high and dry)”. Angered by the many remarks Bathiuddin made, Sri Ranga thrust forward towards the Minister. One eye witness said he received two slaps on his face. Sri Ranga retaliated in defence. Senarath and others present intervened to separate the two. By Tuesday morning, Rajapaksa had obtained a complete debrief of the incident both from his security staff and those present. He tried to reach Bathiuddin by phone but he was unavailable. The Minister was also a notable absentee when Rajapaksa travelled to Mullaitivu to address an election rally on Thursday. Sri Ranga has not been seen at ‘Temple Trees’ since then. However, for the Sri Lanka Muslim Congress (SLMC)’s beleaguered leader Rauff Hakeem, the incident came as acute embarrassment. His party’s negotiations with the UPFA leadership were at a delicate stage and here was one of his parliamentarians acting on his own without clearance. There are increasing signs that the SLMC will eventually end up supporting the UPFA Government. Hakeem told a meeting of his parliamentarians recently that if he were to take a decision, all of them should follow suit. Some of the MPs spoke openly about their intention to remain with the Government when they attended a dinner on Thursday to mark the Qatar National Day at the Colombo Hilton. One SLMC parliamentarian told a foreign guest at the dinner, “Even leading businessmen are asking us to remain. We do not want to damage the interests of the Muslim community by quitting.” Some businessmen who need the support of the Government to carry out their business do not want to see the exit of the SLMC from the UPFA Government. However, that is not to say that the Congress is in the habit of consulting businessmen before deciding on issues affecting the Muslims whom they claim to represent. To the contrary, the party breathed fire and thunder after the attacks on Muslims in Alutgama, Dharga Town and Beruwala in June this year. It lobbied many a West Asian country to protest to the Government. The SLMC’s acute embarrassment is now telling. Much like the businessmen who do not want it to leave, there are also those in the Congress who are in big business. They do not want to leave either. Thus, any move by the SLMC to quit would split the party in two. That is the dilemma for their leader, Hakeem. If he keeps his rank and file intact by supporting the UPFA, he faces the prospect of a defeat at a future parliamentary election. On the other hand, choosing to quit will mean some of his members will stay behind. That the Muslim electorate is not happy with the SLMC’s role became clearer at the Uva Provincial Council elections where the party together with the ACPC polled only 5,045 votes. This was of a total of 40,000 registered Muslim voters in Uva. The beneficiary was the United National Party (UNP). The departure of the SLMC altogether, if it does happen, will deprive the Government of eight MPs thus losing its two-thirds majority. On the other hand, in the unlikely event of the SLMC choosing to leave UPFA, there is a strong likelihood of the party being split. At least two of SLMC parliamentarians want to remain. The fact that the SLMC would choose to either remain with the Government or move out would not on its own generate the overwhelming support of Muslim voters. As the results of the Uva PC polls revealed, the party’s support base has eroded. Moreover, during recent talks with UPFA leaders, an SLMC delegation led by Hakeem has already won a string of concessions. The Government has agreed to the SLMC’s request to shift an Army camp in Pottuvil and offered to expedite payment of compensation for lands belonging to Muslims and taken over during the construction of the Oluvil Harbour. A contentious issue has been the carving out of a separate Divisional Secretary’s Division comprising Pottuvil, Kalmunai and Sammanthurai areas. Instead of this, the Government has said it has already appointed an Additional Government Agent or Additional Divisional Secretary at the Secretariat in Batticaloa. Talks are continuing. 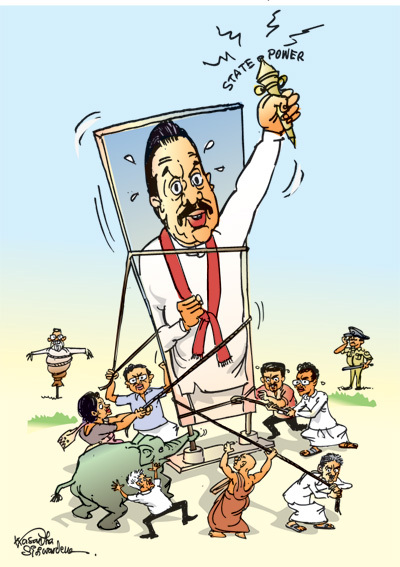 If those were some internal issues in the UPFA, it was no different in the National Democratic Front (NDF). One of the key partners, the Jathika Hela Urumaya (JHU) saw a division in its ranks with the exit of Deputy General Secretary and Western Provincial Councillor Udaya Gammanpila. He said yesterday that 17 out of 29 local councilors of the JHU had joined hands with him to form a new party. Seven out of eight monk councillors were among them, he claimed. “I left the party alone and did not try to take anyone along with me. Others joined on their own,” Gammanpila said. JHU General Secretary Champika Ranawaka responded to Gammanpila’s remarks by saying, “We will not be discouraged by people crossing over and slinging mud at us.’ He said, “We are very clear that there should be good Governance in the country. The economy is bankrupt and the level of corruption is high. Therefore the system should change,” he said. Yet, the media campaign carried out for the NDF by the Jathika Hela Urumaya (JHU) appeared more effective and focused compared to its other main partner, the UNP. On Friday, the UNP made several efforts unsuccessfully to obtain a public venue to launch the NDF’s Manifesto. Later, it was forced to pick on the Open Air Stadium at the Viharamahadevi Park. The ceremony which was to begin at the auspicious hour of 9.45 a.m. was stalled for a while due to an unexpected power interruption. Immediately thereafter the standby generator was commissioned. “The President needs the assistance of the Parliament to change the post of Executive President. That is because it is Parliament which has the power to amend the Constitution. Yet Parliament was unable to effect this change for the past twenty years. It is the President who is the leader of the main party who should provide the leadership to pass the Constitutional Amendment with a two-thirds majority. For that the President should take the initiative to reach an accord among main political parties. It is to fulfil this task that I decided to come forward as the common candidate of all the people at this Presidential election. “I can obtain the support of the Members of Parliament of the Sri Lanka Freedom Party that has the majority in Parliament. Also the United National Party has signed an agreement with me to effect this amendment. The Janatha Vimukthi Peramuna has agreed with our Party to do so in 1994. The Jathika Hela Urumaya has signed an agreement with me to support this measure. Therefore I will discuss with other parties and pass the amendment without fail within hundred days. “In order to change the Executive Presidential System I am taking as background material agreements for the abolishing of the Executive Presidential system reached by the Movement for a Just Society headed by Venerable Maduluwawe Sobhita Thera as well as the proposals contained in the Draft 19th Amendment compiled by the Pivituru Hetak Jatika Sabhawa headed by Ven. Athureliye Rathana Thera which proposed a Constitutional alliance of the President and the Prime Minister. I will also consider the changes proposed to these proposals by the United National Party. No doubt, Sirisena has assured that he will “discuss with other parties and pass” the Constitutional Amendment “without fail within hundred days.” Notwithstanding such an assertion, the wording of the promises relating to Constitutional changes is, to say the least, at variance. For example, he acknowledges that the draft 19th Amendment compiled by Pivituru Hetak Jatika Sabhawa would be taken into consideration. Pivituru Hetak has already circulated a draft 19th Amendment which makes clear that the Executive Presidency should remain whilst some of the powers vested in the President, should be removed. They say that a President should be liable for Court action. In marked contrast, the UNP and the Movement for Just Society are in favour of abolishing the executive presidential system. In this situation, Sirisena, if elected will have the unenviable task of first talking to parties holding diverse views in the first hundred days in office. That again is to first determine the contours of proposals to abolish the executive presidency. That in itself is no easy task. It is no secret that previous aspirants to the presidency have made similar promises to abolish the executive presidency. One was in 1994 when presidential candidate Chandrika Bandaranaike Kumaratunga gave an assurance in writing to then Janatha Vimukthi Peramuna (JVP) candidate Nihal Galalppathy. That assurance led to JVPers extending support to Kumaratunga though Galappathy remained the party’s official candidate. Another instance was in 2005 when Mahinda Rajapaksa contested the presidential election for the first time. His Mahinda Chinthana or thoughts of Mahinda contained a pledge to abolish the executive presidency. Little wonder, the late J.R. Jayewardene, the architect of the 1978 Constitution remarked that they (the Presidents) talk foolishly when they are not in office but act wisely when they inherit it. If some partners of the NDF were committed to restricting the number of Cabinet Ministers, the Sirisena Manifesto simply says it would “be determined on a scientific basis.” Though one may not agree, the UPFA could argue that a larger Cabinet of Ministers, Deputies and Overseeing MPs are formulated on a “scientific basis.” To that extent, the assertion is misleading and meaningless. However, more pointed is the reference to how corruption is to be tackled. Sirisena says, “I will further strengthen and activate the Commission to probe Bribery and Corruption by making it an independent commission recognised by the Constitution. Action will be taken to reinforce corruption prevention structures in accordance with the Anti-corruption Charter of the United Nations to which Sri Lanka is a signatory.” In marked contrast, the independence of the judiciary, a subject which has been drawing considerable attention in the past many months, Sirisena’s response appears somewhat lukewarm. He says, “I will establish the Judicial Services Commission to ensure the independence of the judiciary. It will appoint and promote judges according to seniority and merit.” It is relevant to mention that a Judicial Services Commission already exists even at present and is tasked with the same objectives. A Special Force will be established combining the National Intelligence Service (the real name should read as State Intelligence Service – SIS), the Special Task Force (Police commandos), Sri Lanka Customs and the Authority for the Control of Dangerous Drugs to suppress drug dealers. A National Land Commission will be established to suspend the autocratic transfer of land to foreign companies for development activities harmful to the environment and to provide opportunities for petty farmers to use land for cultivation purposes. In order to provide urgent relief to debt stricken, the salary of public servants will be increased by Rs 10,000. I will take measures to provide the first instalment of this increase amounting to Rs. 5,000 from February 2015. Within 100 days all political appointments and appointment of relatives attached to the Foreign Service will be annulled and the entire Foreign Service will be re-organised using professional officials and personnel who have completed professional qualifications. Our foreign service will be transformed into one with the best learned, erudite, efficient personnel who are sincere to the country and who hold nationalist opinions. Equal relations will be established with India, China, Pakistan and Japan – the principal countries of Asia — while improving friendly relations with emerging Asian nations such as Thailand, Indonesia and Korea without distinction. Our India policy will take into consideration the diversity of India. I would act to have closer relations with an attitude that would be neither anti-Indian nor dependent. I will take steps to investigate and take legal action over contracts, advisory services and other facilities given to various private institutions and persons by the Foreign Ministry and the Central Bank. The involvement of State intelligence agencies for political and civil activities will be prohibited by law. I will initiate an international investigation with the cooperation of foreign countries on persons who have robbed Sri Lanka’s wealth and taken it abroad. All wealth earned through improper means will be given back to the people. The service of all officers of the Civil Defence Force will be made permanent. The employment of all officers of the Security forces in occupation that undermine the dignity of their profession will be terminated and they will be directed to social services that would safeguard the dignity of their service. The practice of doing domestic work at politician’s houses will be completely stopped. Maintenance of a free media will be ensured by stopping direct and indirect threats and intimidation against print and electronic media, their owners and media personnel as well as abductions by white vans and killings. The UPFA’s manifesto is also expected to speak of a new Constitution for Sri Lanka. It will be released at the auspicious hour of 11.55 a.m. at a ceremony at the BMICH tomorrow (Monday). With just three weeks more for the polls, the campaigning on both sides is now gathering momentum. The two manifestos, no doubt, will influence voters. Notwithstanding this, most appear to be making up their mind on extraneous factors as well. Maithri’s manifesto – where does the roadmap lead? Will there be changes in economic policies in 2015? Will Santa gift a new conscience this X’mas?